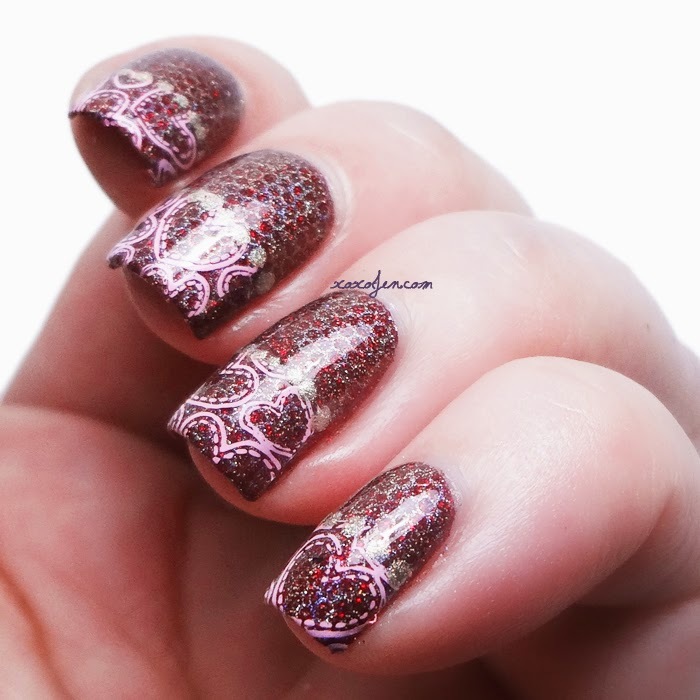 xoxo, Jen: HPB Presents: Valentine's Day Mani Link Up! HPB Presents: Valentine's Day Mani Link Up! 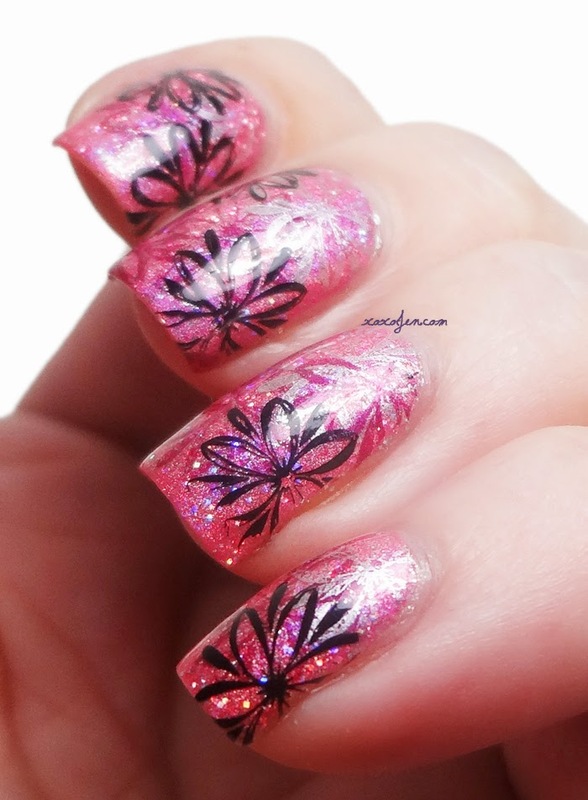 The Hobby Polish Blogger's group that I am a member of is at it again with another link up! This time, Valentine's Day manis. I hope your Valentine's day is special! 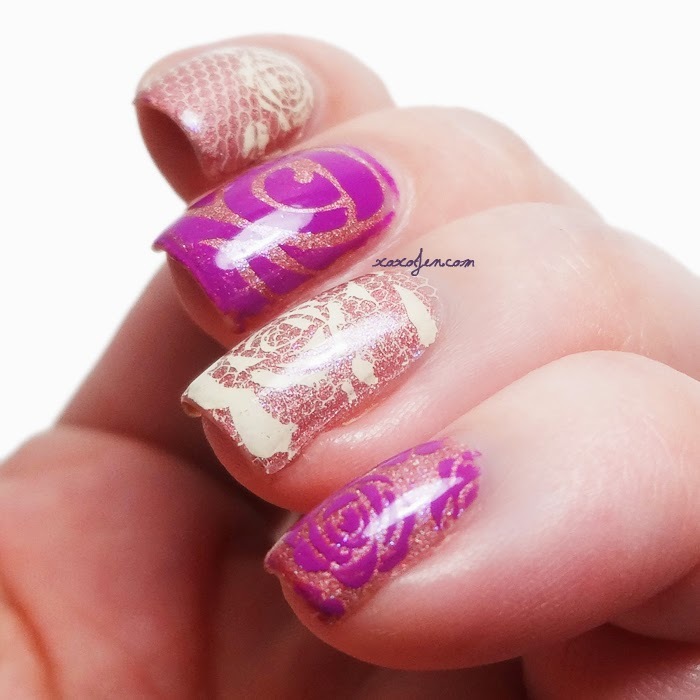 First is a mani of roses and lace stamped with Mundo de Unos stamping polish and Vivid Lacquer plates on top of Black Dahlia Capital Rose Garden. Next is hearts and fishnets stamped with Mundo de Unos stamping polish, Vivid Lacquer and Bundle Monster plates on top of Blue-Eyed Girl Cuts In My Heart which also has Sweet Heart Polish Josh layered over it, beneath the stamped design. Third is all flowers! 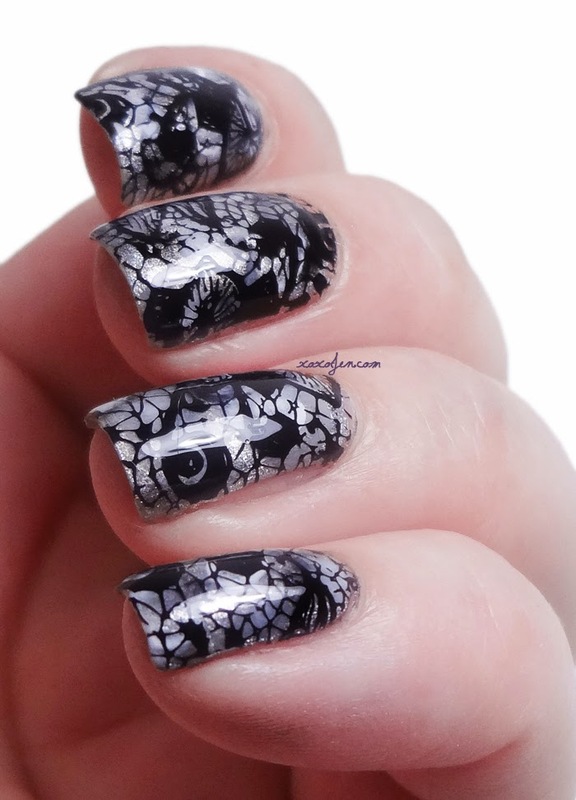 I started with Literary Lacquers Laughs in Flowers and stamped it with a flower design from Bundle Monster plates in a layered pattern with Konad Black, Blue-Eyed Girl Cuts In My Heart, and Pop-arazzi Glam Factor. Lastly is a black lace design stamped with Konad Black and Vivid Lacquer plate designs over a technique called watercolor that I learned in the Simples group on facebook. Please feel free to visit our other group members blog posts in the link up below! These are all so pretty! Perfect for Valentine's Day. Thank you so much Lisa! Have a great Valentine's day! 4 manis? Overachiever <3 These are all so pretty! I've been planning the the Vday post since around Christmas! I just love the heart theme and the colors! Love, love, love the flowers one!! I loooove the flowers! So pretty! I love all of these! It makes me want to get out my stamping plates and start practicing. You should!!! It's a lot of fun once you get started. I think I spent four hours one day - I'd lost track of time! Wow, these are all wonderful. I especially like the last one. It has so much depth.